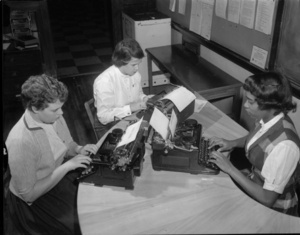 Nancee Meyers, Jean Loy, and Colenthia Hill work on an edition of the "Madison Mirror". Image WHi-37285 used with permission: Wisconsin Historical Society. The Madison Mirror was a student newspaper created and published by the students of Madison (Wis.) Central High School. 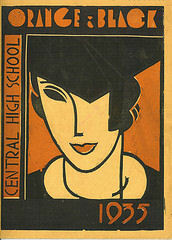 The newspaper was published from 1924-1969. Originally printed and distributed as 4 to 16-page issues, the newspapers were later bound together into hard-cover volumes. A handwritten inscription on the opening page of the first volume reads, “Madison Central High School, To be kept in office vault.” The first issue measures approximately 10” x 13” and is dated February 26, 1924. The inaugural issue announced that the Madison Mirror would be published semi-monthly by the students of Central High School. The price: Five Cents. The newspaper articles focused primarily on issues of immediate concern to its readers: classes and activities. The newspaper also offered opportunities for students to hone their writing talents with regular columns. There was ample coverage of the arts, including articles about the school’s theater productions and musicals. For many of the first 25 years, the newspaper featured student graphics, often woodcuts. The newspaper carried news of student and faculty travel, guest lectures, honors, and during World War II, updates on former students in service overseas. Through the years, coverage of scholastics and athletics seems to appear in about equal measure. Scholastics could include news of academic clubs and teams, the National Honor Society and the honor roll as well as information about classes and special educational opportunities. In October 1930, advertisements appeared for the first time. The Madison Mirror’s practice of printing advertising continued until the last school year, 1968-69. Though advertising’s immediate purpose was to bring in revenue for the newspaper, the longer term effects include providing us with information about student life of that era. June 5, 1969 marked Central’s last official day. Two weeks later, on June 19, 1969, Principal William Marsh donated a substantial amount of material to the Dane County Historical Society, including copies of the school’s yearbook, Tychoberahn, and a complete run of The Madison Mirror; programs for graduating exercises; and other materials.